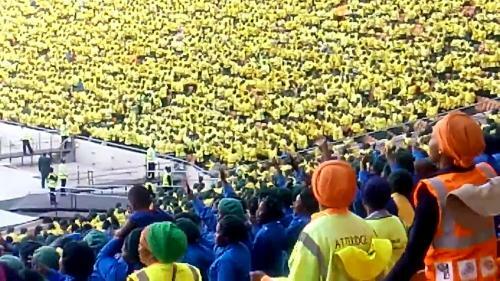 Thousands of worshippers from various denominations packed FNB Stadium in Johannesburg for the 2018 National Day of Prayer for all South Africans. Hosted by the Motsepe Foundation in collaboration with 33 religious and faith-based organisations, the gathering brought more than 100 000 worshippers to pray for divine guidance, leadership and blessings for a bright future for all South Africans. The worshippers also prayed for the creation of jobs, equality of opportunity and the provision of quality education and skills; an end to poverty, corruption and crime, particularly crimes against women and children, and for unity among South Africans of all races and languages. President Cyril Ramaphosa also attended the event in support of the initiative. Traditional leaders, government, business, organised labour and civil society were also amongst the worshippers. President Ramaphosa welcomed the initiative by faith-based organisation and congregants who come out in their numbers.